It’s time for the 7thAnnual Monte Carlo Night sponsored by the PVHS Boosters. Your ticket purchase allows you to write the name of club, program, or team to support on the ticket stub when you arrive at the event. Proceeds from Monte Carlo Night will directly benefit the program or team you choose!! 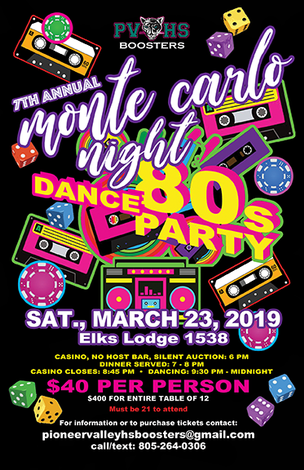 This years theme takes us all back to the 80's so put on that leisure suit, or your loudest neon colors, bring your BOOM BOX and enjoy the evening with us. Mullets, Big Hair and leg warmers definitely welcome! This is bound to be a very fun evening!! Tickets for this adults only event includes an evening of "fun-raising" while supporting PV athletics and student activities! Silent Auction, Casino Games, No Host Bar opens at 6:00pm. Sit Down Dinner Served from 7:00 to 8:00pm only. Dancing from 9:30 pm to Midnight!